To be a champ you have to believe in yourself when nobody else will. Rinitha is pursuing Mechanical engineering and shares her wonderful experience of internship days. It was the month of October. We, the basketball team of NIT Trichy, were on a train, on our way back to college from a tournament that we had attended in IIT Kanpur. The long journey saw one of the most important conversations of my life, when my senior told me to start applying for summer projects at that time itself. In particular, this one summer research internship program called IAS SRF (Indian Academy of Sciences – Summer Research Fellowship). This is basically an opportunity to work in an IIT or in IISc for the summer as a research intern under a professor. She said that my CGPA was good enough for me to get through. At that time I didn’t believe her. There were two reasons to that- one being she was a highly optimistic person who always hoped for the best. The other and more predominant one being the fact that I am the epitome of low self-confidence. I heard from other seniors that it wasn’t an easy intern to bag. That pushed my hopes down further. I used to believe nothing great or out of the ordinary can ever happen to me. But after continuous nagging and lots of “You’ll get it, believe me!” I went ahead and applied for it. And believe it or not I forgot about it. That was the level of confidence that I had on myself! A few months later, I randomly receive a text from a friend congratulating me on the IAS project. I thought I was being pranked. I went in a flurry, and checked the online page. To my absolute and pleasant surprise, my name was on the list! I had bagged a project in the mechanical department of IISc. I vowed to work well and make it worth it. My home is in Bangalore itself so I had decided to travel everyday instead of taking up accommodation somewhere close to IISc. I had to travel for about 3-4 hours every day and change 6 buses in total, each day. And so, summer arrived. Time to prove myself and make the best of this golden opportunity, I thought. And then this happened. So on the first day, my professor and I had to discuss about what my work would be for the summer. He asked me a few basic questions so that he could assess my skills and allot me with specific work. But I choked. In my mind, this was an interview. And I am bad with interviews and public speaking. I know those two are very important in anyone’s life. No matter what you end up doing they are absolutely essential. But that’s just the way I am. Maybe it is a mental block and I tell myself that I can’t do it. So anyway, I could tell that my prof was really disappointed in me and I was thoroughly embarrassed. In the end, I told him that apart from core, I was interested in coding. Upon learning that, he asked me to learn the python programming language and gave me a few books for the literature survey. So the first 10 days went in that. I really enjoyed learning python. As the result of my bad ‘interview’ earlier that day, I decided to work on my speaking skills as much as I could. Because if I am not able to express and explain what I know, there is no point to anything I study or learn. After I finished the work I was asked to do, sir took me to the lab, mass flow and heat transfer lab, and assigned my project, thermocouple calibration, and my project partner. My partner was a student from Punjab and had been working on the project since December. So on the first two days my partner explained what he had been working on and what the aim of this project was. We were to use instruments to take measurements from a number of thermocouples and find out the error in them. The errors could be because of a number of reasons. We were to find out the reason for the errors and also how much of the error could be attributed to each of the reasons. Hence, we were to find out the uncertainty associated with the thermocouples. To take measurements, we were going to use python to automate the whole process. This was the overall plan. I started off with fabricating connections for 40 thermocouples. I had to crimp a lot of wires and fix them into DB-25 connectors. These connectors were to be plugged into the instrument at a later stage. Also some of the connections required soldering which I learnt via YouTube videos and trial and error process. Once this was done, the most interesting phase of the project arrived. Coding. I was to make codes with will operate and control the instruments. For this experiment, we were using two instruments – a Keithley DMM and a LabJack u6 Pro. The Keithley DMM is more expensive than the LabJack. A secondary aim of the project was to reduce the cost of calibration. This was to be done by using two instruments of different pricing and show that with careful execution and planning, the results obtained could be the same. During the first month, as I was commuting from home every day, my working hours were very limited. I realized that I wanted to work on my project for longer and besides, that much traveling everyday got me very tired. So during the second month, I shifted into the hostel on campus. This way I could work in a more relaxed manner as there was no curfew. I used to work till midnight on some days as I could concentrate better in the night. Once the setup was done, we had to start the experiment and record readings. There was an ice bath and a water bath, both which had to be maintained at specific temperatures. Then the code was to be run. It takes about 5 hours to finish the experiment once. The whole time the temperatures should be maintained to be constant. So the ice had to be crushed and replaced every two hours. That was a fun bit, working with ice! Along the way, we had a lot of spurious readings and hurdles to overcome in performing the experiment and getting the desired results. But with prior experience that my partner had and our combined hard work, we got as close to the desired result as we could. When our professor said he was happy with our experiment, we made a presentation and presented it to the rest of the students working in his lab. So after two months of research work, I learned and realized a lot. I realized that I liked the research environment but not exactly in the field of my work over the summer. Coding is cup of tea but I am not very fond of data analysis. I realized that I really have to work on my public speaking skills and conquer my stage fear. I learned a lot on the technical front as a result of my project; it was a continuous learning process. I attended a lot of seminars during my stay in IISc, on robotics, technical writing, evolution etc. I met different kinds of people and realized that every person has a story which is not at all apparent, when you first talk to them. In fact, you might never get to know everything there is to know about a person. All in all, I am hoping to get another project to do this summer, in my field of interest (which I am yet to narrow down upon), and have another great summer to remember. 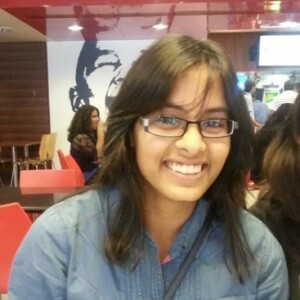 If Rinitha’s experience motivates you, you can check the latest internships in Bangalore. Very good experience shared and it also give me learned and realized many thing…………………..i hope also get internship at IISC OR BHEL…………………..i would give my best of it.